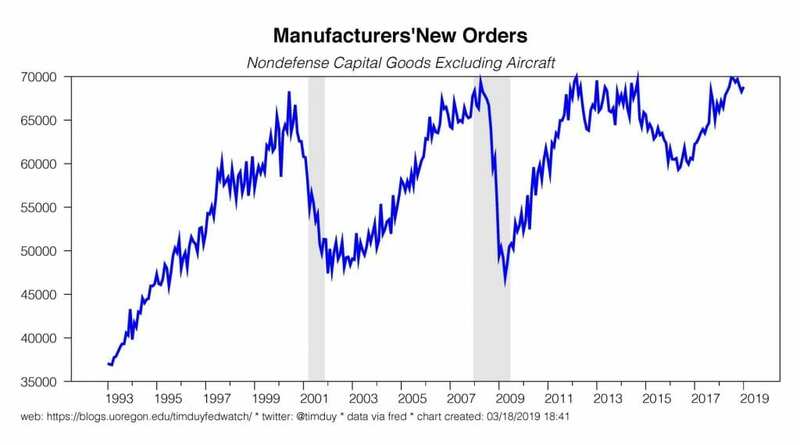 Manufacturing may again be the odd man out in an otherwise solid economy. This has the feeling of 2015-16, though less severe. 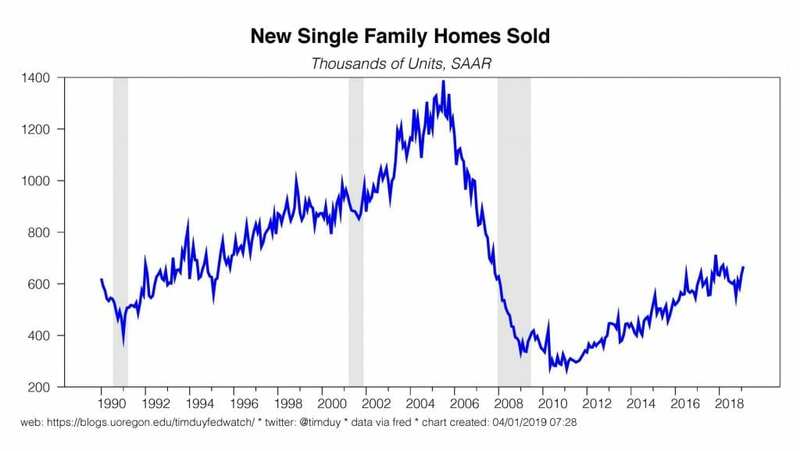 The Federal Reserve seems to be achieving the fabled soft landing. 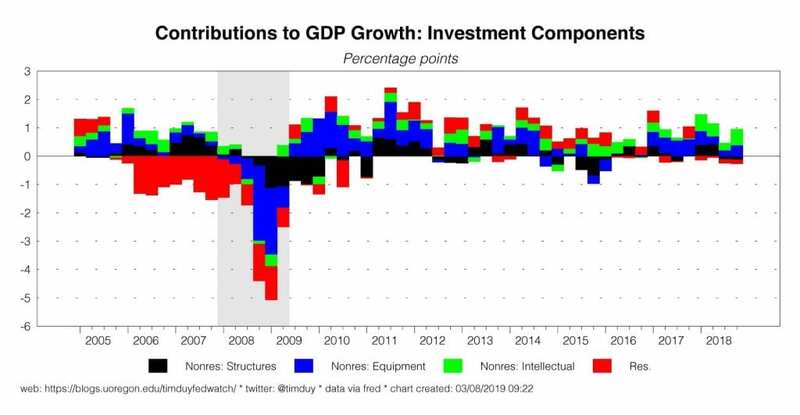 With growth likely to transition down toward the longer-term trend in 2019, expect monetary policy to remain on hold for the foreseeable future. If the Fed were to move, the odds still favor an interest rate cut over an increase. 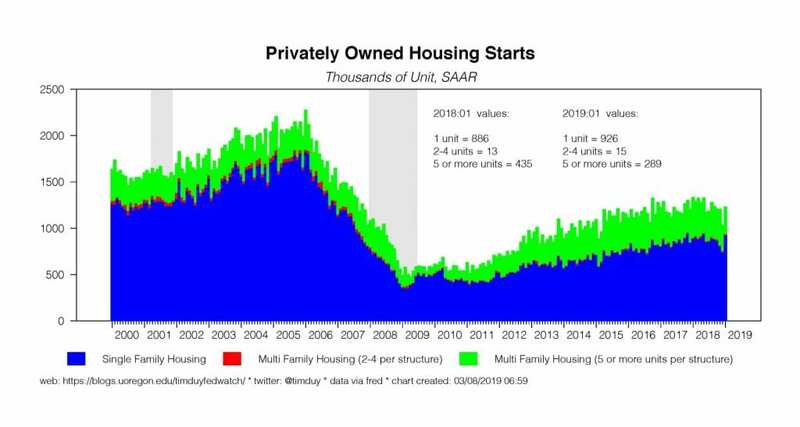 We are likely at the peak of this rate hiking cycle. I have been puzzling on this issue this week. 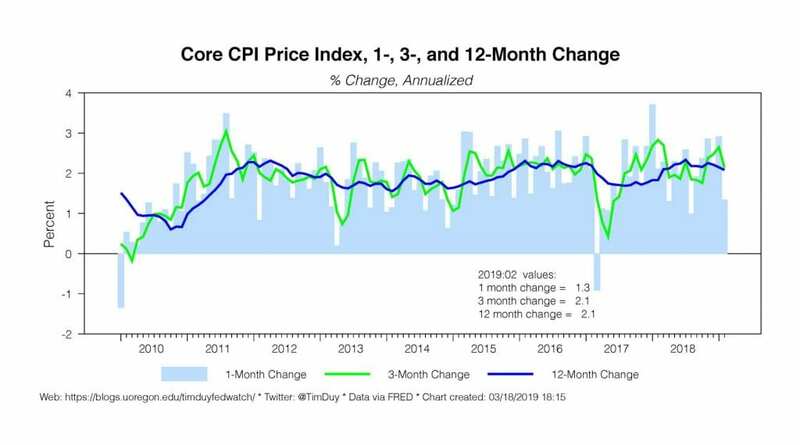 I think the conclusion that the Fed wants to see more conclusive evidence of inflation before hiking is correct. 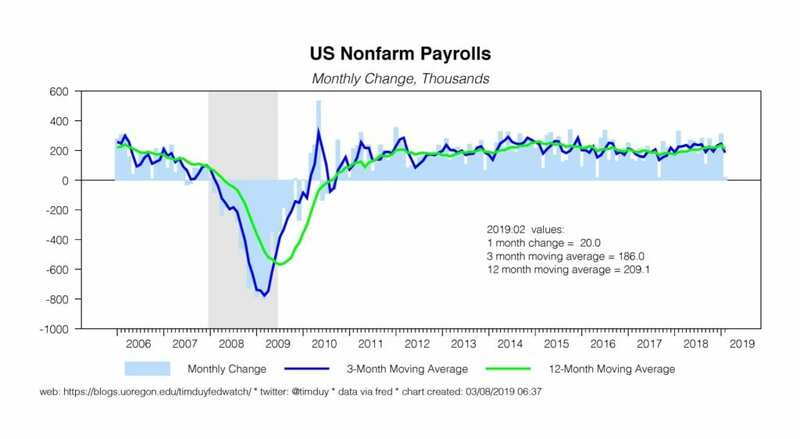 That’s the way the Fed is moving. That said, I fear they may be inadvertently setting a trap for market participants. It’s that nasty time-consistency policy problem bouncing around in the back of my head. 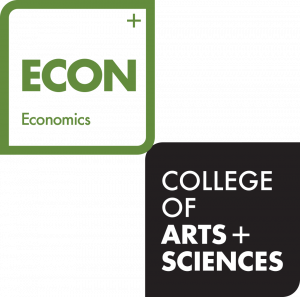 I am not confident that what they will ultimately think is convincing evidence of inflation’s return will actually be convincing evidence of inflation’s return. Teaser alert: I am working on a longer note on this issue, which should be complete early next week. 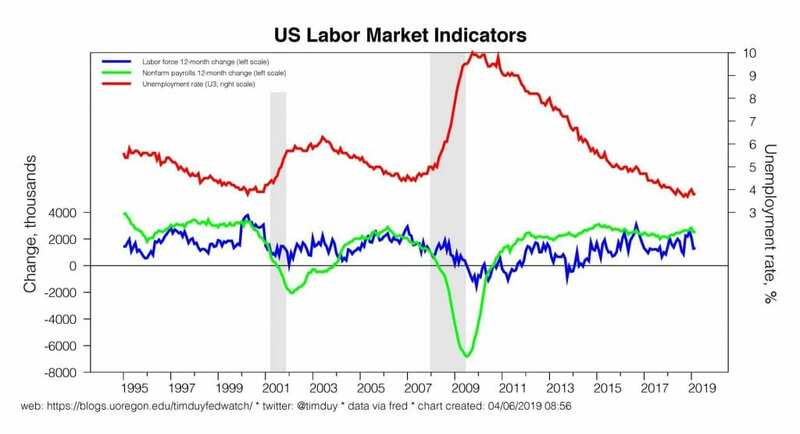 A Hint of Weakness in the Employment Report? 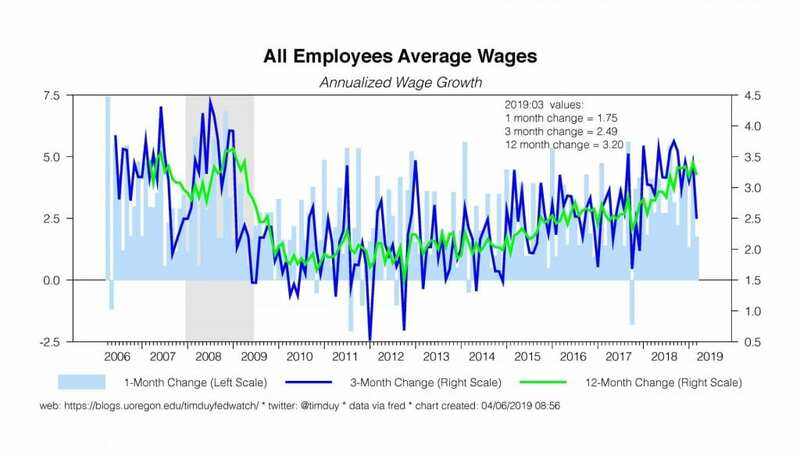 That kind of strength will leave the Fed felling confident that they do not need to cut rates in the near-term. 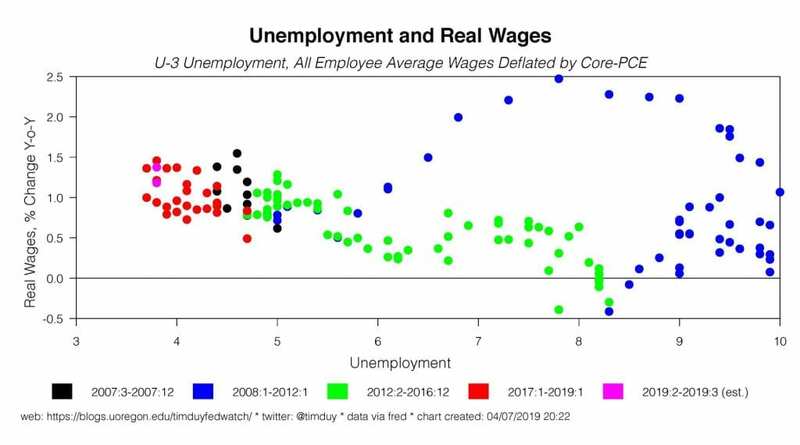 Moreover, the continued stability of the unemployment rate means they don’t have to hike rates either. Hence, their strategy of remaining patient still holds. 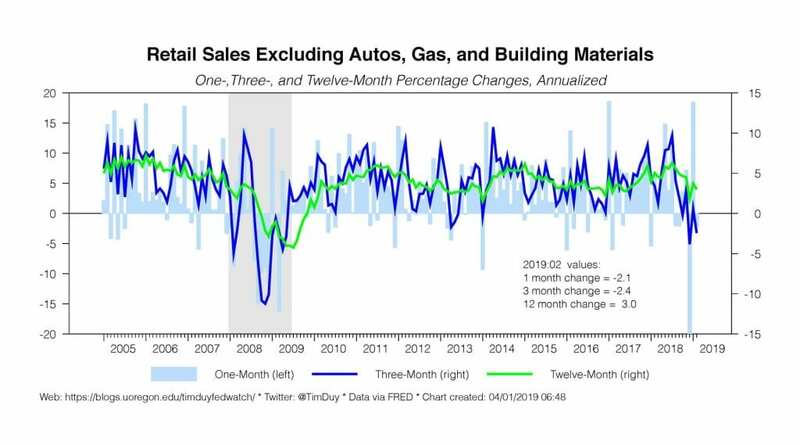 Nothing there yet to suggest that a deeper slowdown of activity is underway. 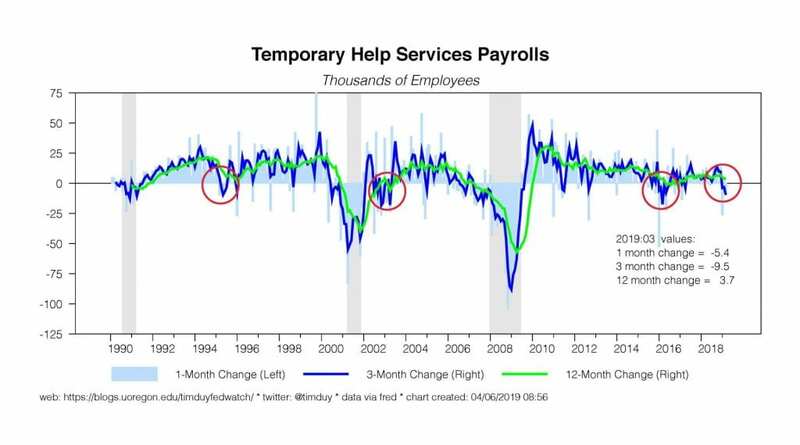 That said, I have been a long supporter of temporary help employment as a leading indicator, and I would be remiss in my analysis if I didn’t identify it as something to keep an eye on. 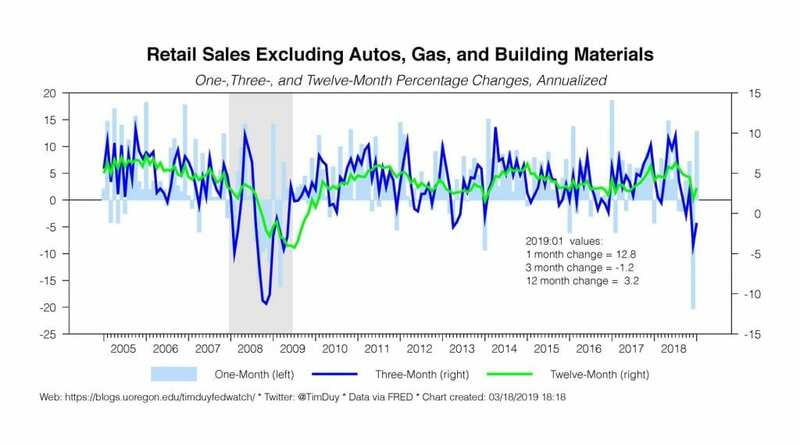 One can also look toward softness over the part two months in manufacturing and retail trade as signs that activity is slowing underneath the surface of the numbers. 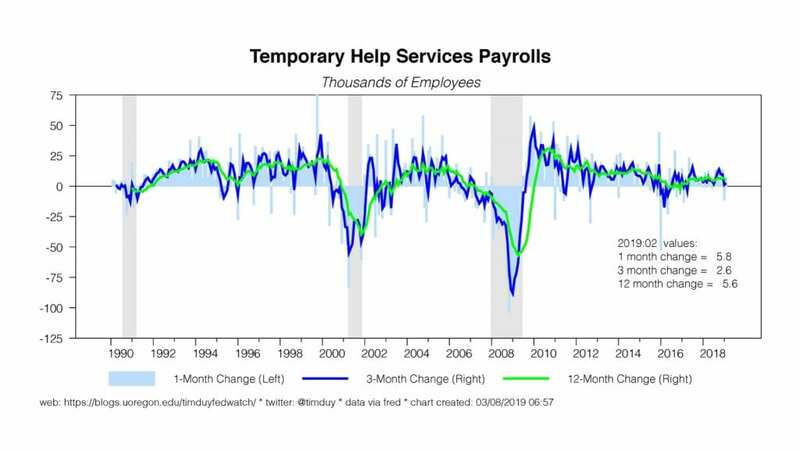 Bottom Line: The employment report gives little reason for the Fed to exit its “patient” policy stance. 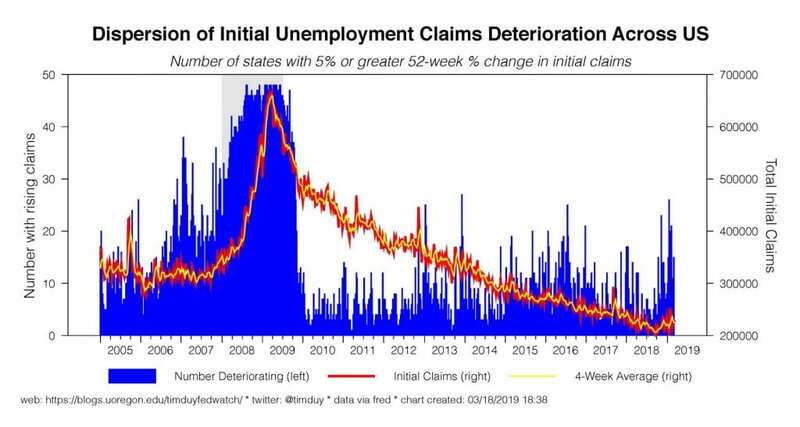 Keep an eye on the temporary employment numbers. 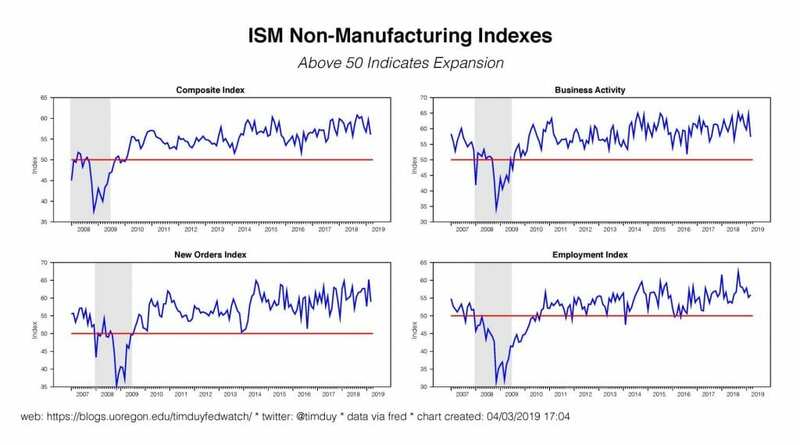 It’s a leading indicator in the report; recent declines are notable. 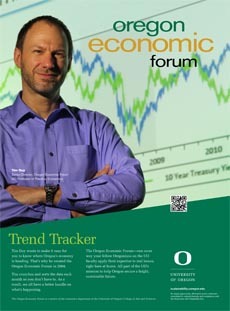 Should we worry about consumer spending? 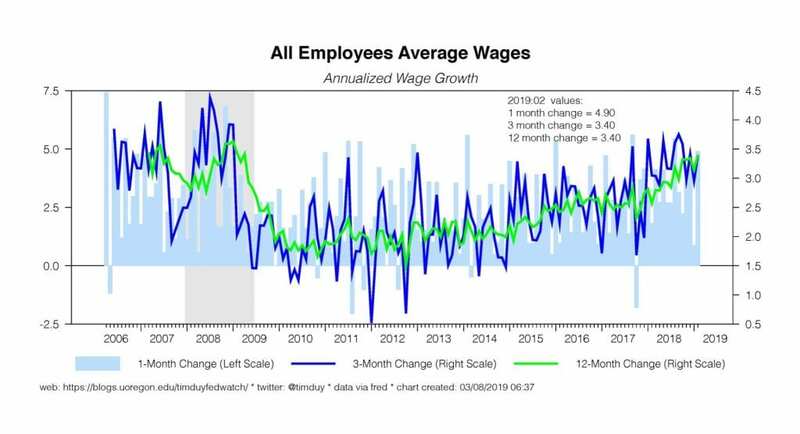 I think it will slow this year relative to last, but I would not anticipate a sustained and substantial downturn absent a sharp deterioration of the job market. We get the employment numbers at the end of this week; the initial claims numbers have yet to give us much to worry about. 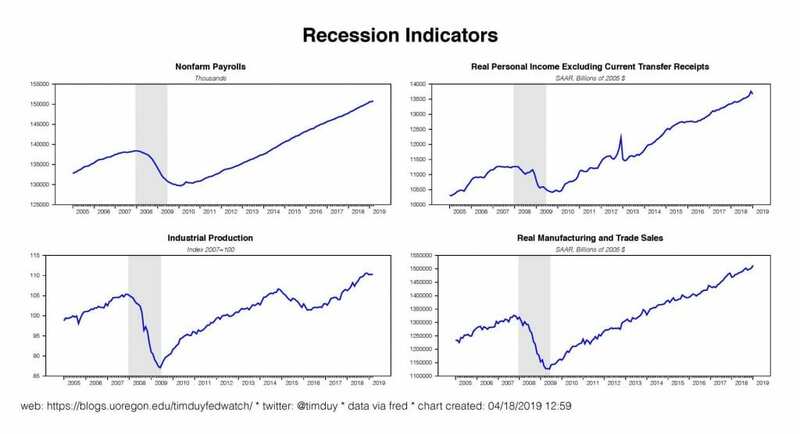 So are we out of the woods as far as a recession is concerned? 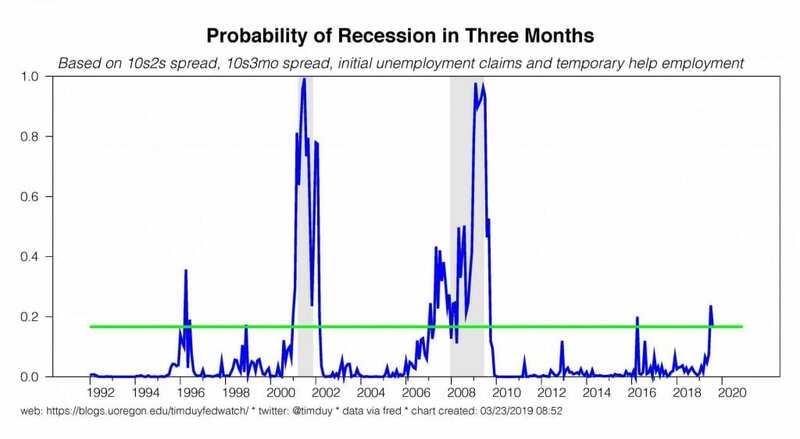 For what it’s worth, the case of an imminent recession was never very strong and still isn’t despite the recent yield curve inversion. 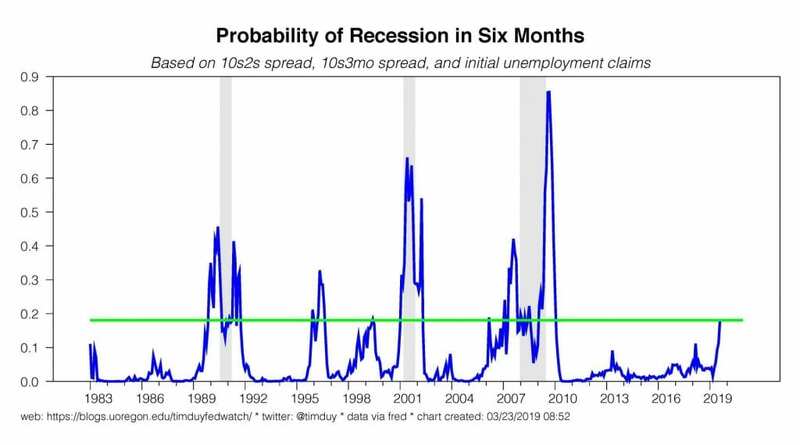 It is always forgotten that the yield curve is a very long leading indicator; an inversion might happen a year or even two ahead of a recession. 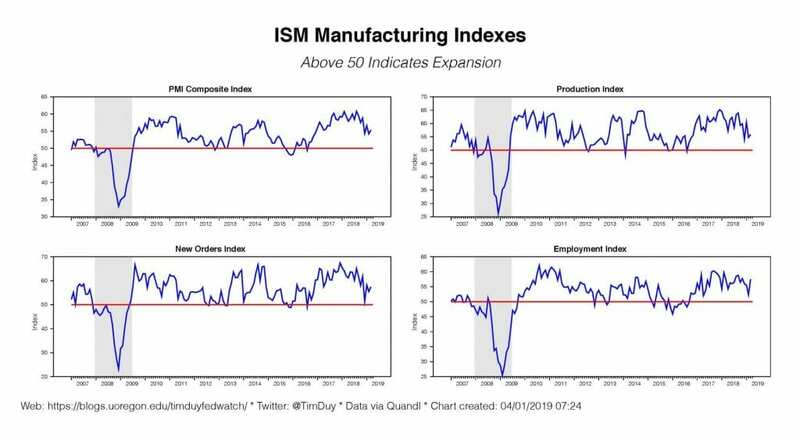 Hence, what you should expect for some time after an inversion is that incoming data remains consistent with steady if not solid economic growth. 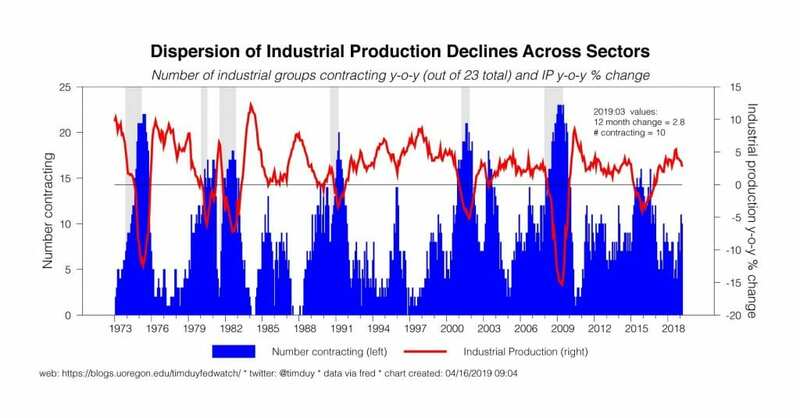 Nor does the inversion itself guarantee recession. My view is that the Fed still has time to prevent a recession even after an inversion (the worst risk is that the Fed keeps hiking after inversion) and the Fed has gone a long way toward holding the expansion together by shifting to a more dovish stance in recent months. 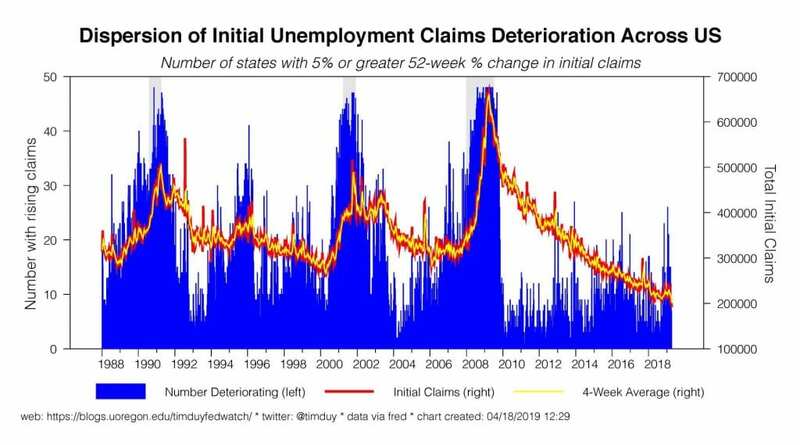 I still believe, however, that they still need to be wary about a recession and be prepared to cut rates ahead of a downturn in the data – see my Bloomberg Opinion piece today. That takes something of a leap of faith on the part of policymakers, a leap of faith they are not always willing to take. Bottom Line: Recession calls were again too early. The economy retains momentum into 2019 even if the pace of growth eases as expected. 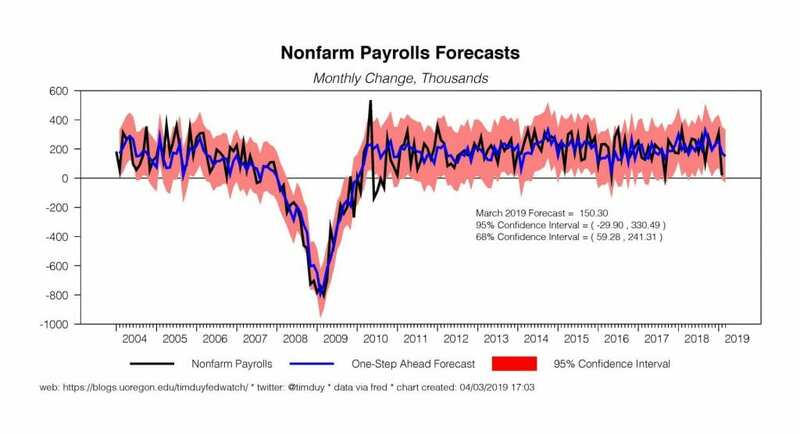 The Fed’s dovish shift should greatly increase the probability that the expansion continues. 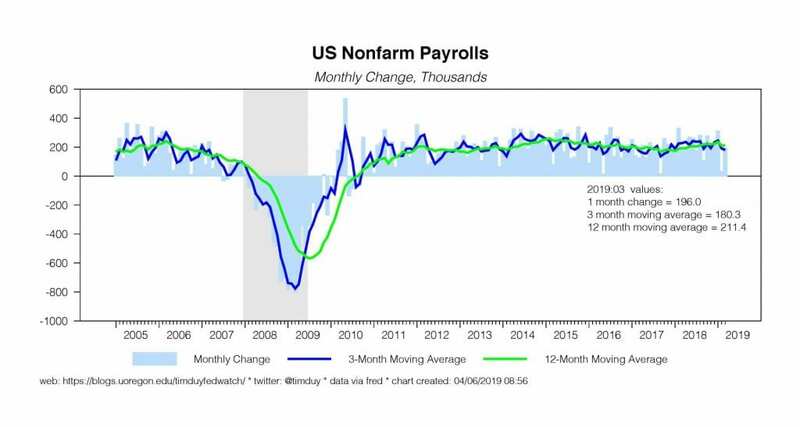 More easing may still be needed.